Finding space in the Cosmos, one page at a time. My month-long Austen Marathon has turned into a 4-month literary journey. In those four months, I didn’t devour Austen’s works the way I imagined I would. Instead, I went through every novel meticulously, reading and rereading specific pages. I wasn’t merely enjoying Austen’s novels, I was studying them. I was in awe of Jane Austen’s tremendous talent. I was green with envy and lily yellow with despair. I tried to look at each work as if I were seeing it for the first time—and I succeeded, mainly because of Austen’s terrific storytelling. Whether it’s a first-time or an nth-time read, Austen’s novels always offers something new to the reader. I suppose, that’s why I’m making some changes to my Austen list of favorites. The following shows the results of my 2012/2013 Austen Marathon. 1. Persuasion. 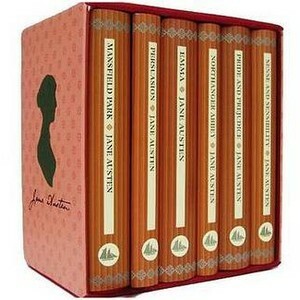 I find this the most realistic and ‘mature’ of all of Austen’s novels. 2. Sense and Sensibility. Because I will always look up to Elinor Dashwood and her tremendous strength. 3. Pride and Prejudice. How could one not root for Lizzie and Mr. Darcy? Least Favorite Work: Mansfield Park. It’s no longer as bad as I used to think it was, but it’s still not as good as Austen’s other works. At least, in my opinion. Have you been watching The Lizzie Bennet Diaries? I get the feeling you might appreciate this very modern take on P&P! My favourite Auste nnovel is Northanger Abbey – it appeals to my love of Gothic novels. Henry Tilney is my absolute favourite Austen hero – he’s just fabulous! Frustrated librarian and literature hound. Hopeless hippie in corpowhore garb. Closet time-traveling groupie. I dream in words and narrate when awake. An old reading list. Going back and forth to Singapore for my dad's treatment with reading as my primary past time has further strengthened my love for literature. As Nora Ephron once said, "Reading is escape, and the opposite of escape; it's a way to make contact with reality after a day of making things up, and it's a way of making contact with someone else's imagination after a day that's all too real." Mood. How Did You Die by Edmund Vance Cooke. Did you tackle that trouble that came your way With a resolute heart and cheerful? Or hide your face from the light of day With a craven soul and fearful? Oh, a trouble's a ton, or a trouble's an ounce, Or a trouble is what you make it, And it isn't the fact that you're hurt that counts, But only how did you take it? You are beaten to earth? Well, well, what's that? Come up with a smiling face. It's nothing against you to fall down flat, But to lie there -- that's a disgrace. The harder you're thrown, why the higher you bounce; Be proud of your blackened eye! It isn't the fact that you're licked that counts, It's how did you fight -- and why? And though you be done to the death, what then? If you battled the best you could, If you played your part in the world of men, Why, the Critic would call it good. Death comes with a crawl, or comes with a pounce, And whether he's slow or spry, It isn't the fact that you're dead that counts, But only how did you die? Thank you @blupamsal and @lespamandanan for the lovely pics and the fantastic company. ❤ prenup shoot done!